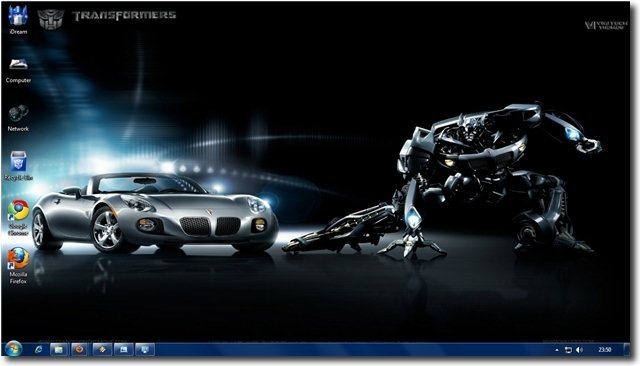 Recently we published the Iron Man 2 Windows 7 Theme and it has become very popular with our readers. 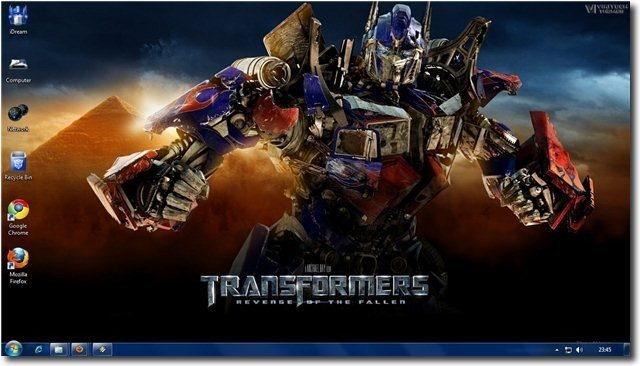 We understand that our readers are technology oriented and they appreciate such movies, so we are releasing another similar theme – The Transformers – Revenge of the Fallen Windows 7 theme. Although Transformers Movie won’t win awards for the script or the story, they certainly are right at the top in use of CGI. The process of seeing a transformer changing into a car or a truck is pretty awesome. 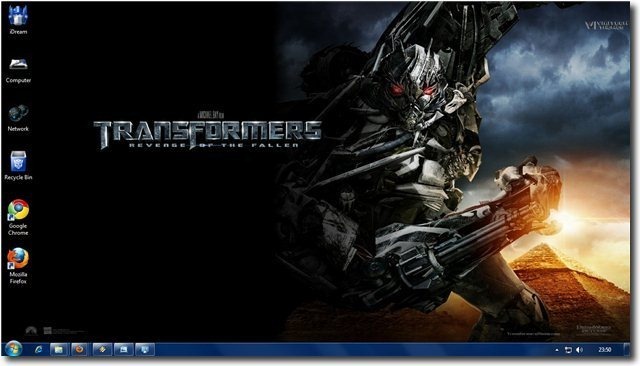 The Transformers Windows Themes consist of 20+ HD Transformers Wallpapers, Custom Transformers icons and Movie sounds bits for a complete Transformer experience on your desktop. 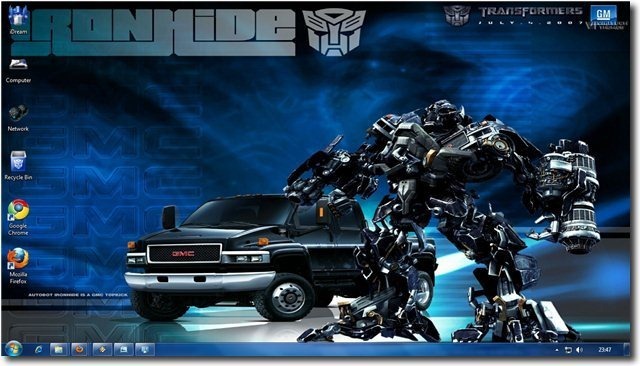 These are just some of the wallpapers you would get with the Transformer Win 7 theme. No theme is complete without custom icons. 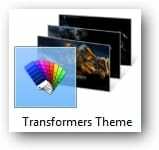 We have included custom Transformers icons with this theme, which will replace the same old boring desktop icons we see everyday. 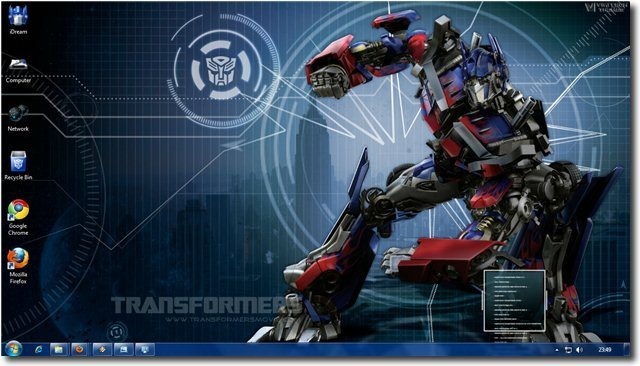 We have a dedicated download page for Windows 7 Transformers theme. You can also explore various other Windows 7 Themes on our themes download page. 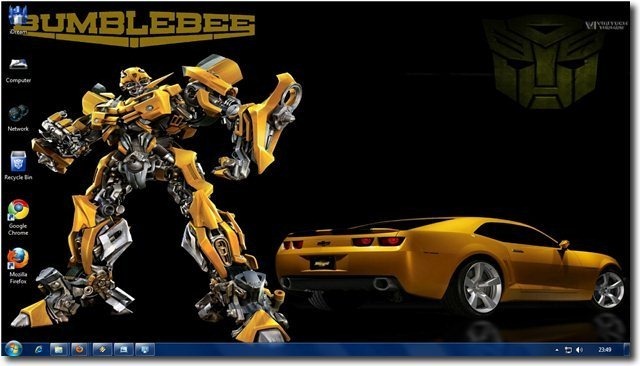 Click here to download The Transformers Windows 7 Theme. Bumblebee’s alternate mode is a 2010 Concept Chevrolet Camaro. This was a redesign of his mode from the first film (a 2009 Concept Chevrolet Camaro), carried out to emphasize Bumblebee becoming stronger and sturdier after his injury from the first film. The Chevrolet logo on Bumblebee’s grill in the first film is yellow, but in this film it is black with a red outline.